Pros: A raucous study of manners performed with panache and conviction. Cons: Script density barely gave actors a pause for breath and typically of 18th century prose, three words are used when one will do. An enduring story that never fails to please with some eye catching performances. 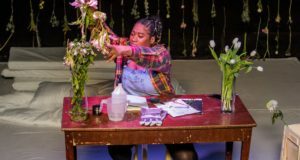 Although a relatively new addition to London theatre, The Arcola already has a fine reputation in presenting a diverse range of plays, operas and musicals. The Rivals is a long overdue revival of Richard Brinsley Sheridan’s 18th century comedy of manners. It was refreshing to see cast members, in full costume, wandering around chatting to members of the audience and handing out programme sheets, literally minutes before the show started. 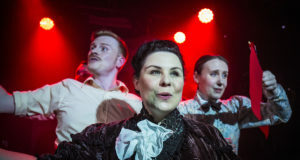 It created a wonderfully informal atmosphere and gave the audience a much closer connection with the players and the production itself. 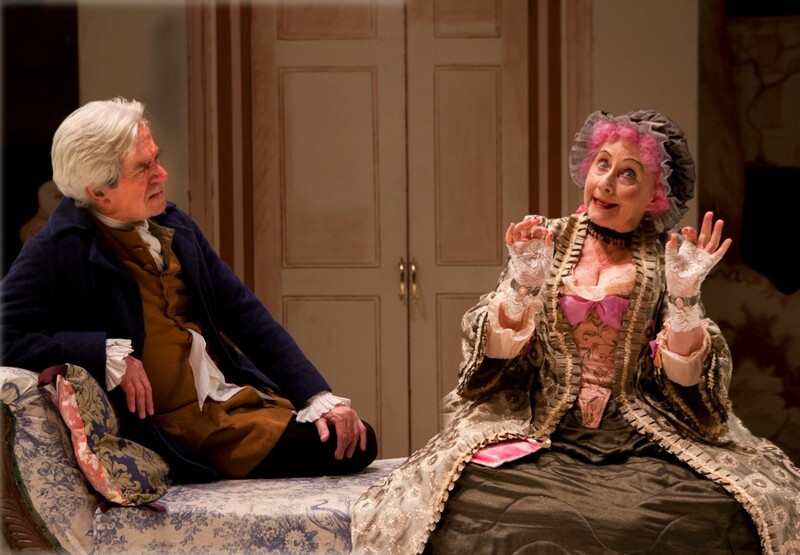 The story takes us back to Bath in the 1770s and the tribulations of two courting couples. Lydia is obsessed by popular novels and longs to be swept away by a dashing poor soldier against her family’s wishes. Jack plans to woo Lydia as poor soldier Ensign Beverley. Lydia is captivated by the idea of eloping with Jack despite the objections of her guardian, Mrs Malaprop. Through her continual misuse of words, Mrs M is of course the legendary inspiration for malapropism and delivers a stream of delicious double entendre. Lydia has two other suitors; Bob Acres, a country gentleman and Sir Lucius O’Trigger, an impoverished Irish gentleman. Sir Lucius pays Lydia’s maid, Lucy, to carry love letters to Lydia. However, she is actually sneakily delivering replies from Delia who is actually Mrs Malaprop. Meanwhile, Sir Anthony Absolute has arranged a marriage for his son Jack, who protests that he is in love with someone else. Sir Anthony threatens to disinherit Jack if he doesn’t submit to his wishes. However, Jack learns that he has in fact been matched with Lydia. He gladly submits to his father and is presented to Lydia with Mrs Malaprop’s blessing. Jack bluffs to Lydia that he is only posing as Sir Anthony’s son. Lydia enrages Mrs Malaprop by confessing her devotion to Beverley and rejects Jack. The other courting couple in the piece are Julia and Jack’s friend Faulkland. They are madly in love, but Faulkland is insanely jealous and questions Julia’s fidelity. They quarrel needlessly and magnify minor issues in their relationship. The real delight in the piece lay in a series of verbal duels between the characters. We have the dizzy, romantic intrigues of Lydia and Julia; the clumsy posturing between Acres and Sir Lucius, who don’t realise they both have designs on Lydia; Jack’s counselling of Faulkland in his romantic woes; but best of all Sir Anthony’s wickedly funny exchanges with Jack. Here, Sheridan’s skill as a comedy writer comes to the fore. Sir Anthony spits venom at Jack who responds with a similarly spiteful tirade. However, when Sir Anthony thinks he’s got the upper hand he becomes the proud father; Conversely, Jack smugly thinks he’s hoodwinked his father. The dialogue swings between extremes and is a joy to witness. It must also be said that the script is heavily padded and could benefit from selected editing. I have never heard so many words crammed into three hours; and is a tribute to the dexterity and memory of the players. Cast members were magnificent in their respective roles and they obviously enjoyed the experience; always a bonus for the audience. 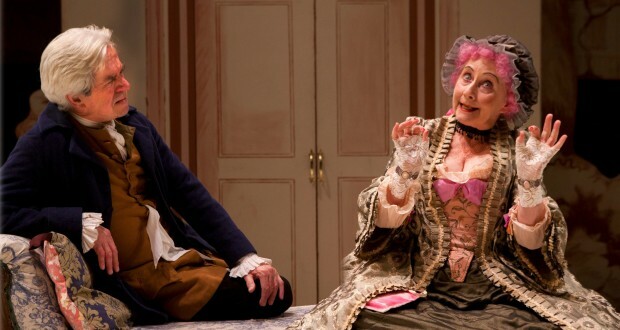 Nicholas Le Prevost was superb as the curmudgeonly, endearing Sir Anthony; Ian Bachelor turned in a powerhouse performance as Jack and Gemma Jones was a stately presence as Mrs Malaprop. At a touch over three hours, time passed quickly which is surely the hallmark of an excellent production. I was pleasantly surprised by the number of actors in the audience but tormented by familiar faces to whom I couldn’t put names. A play watched by actors must be the ultimate endorsement; not that one should be needed for a performance of this quality.